Died: 12 Feb 1915      at: Campbell Co., Bolton Cemetary, Morely, Tn. Born: 21 Oct 1872      at: Campbell Co., TN. Died: 2 Sep 1944       at: Leach Graveyard, TN. 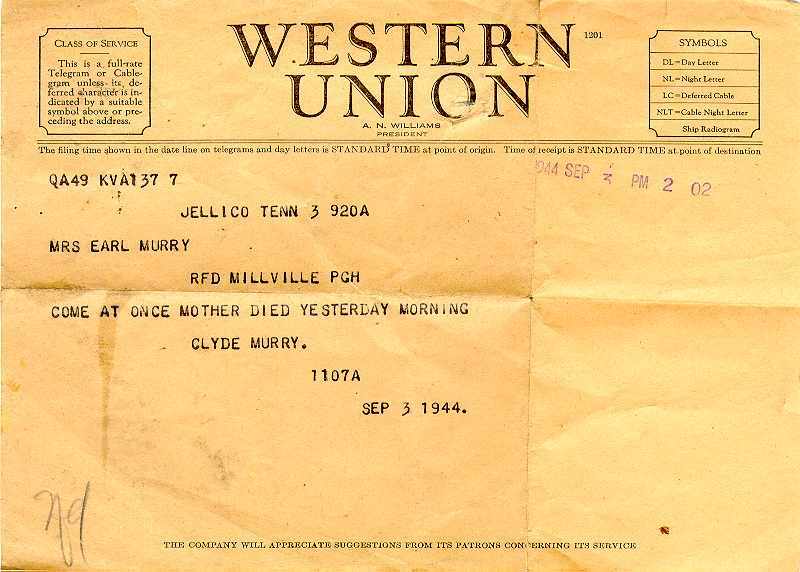 1944 Western Union telegraph stating the death of Martha Elizabeth Murray (George Earls Mother) from Clyde Murray to Leona Murray. Married: 4 Jan 1930       at: Ross Township, Pittsburgh, Pa.
Born: 28 Oct 1891      at: Jellico, TN Campbell Co.
Born: 27 Jul 1893      at: Jellico, TN Campbell Co.
Born: 20 Apr 1895      at: Jellico, TN Campbell Co.
Died: 17 Jul 1920      at: Leach Graveyard, TN. Campbell Co.
Born: 10 Mar 1898      at: LaFollette, Campbell Co., TN. Born: 11 Jul 1903      at: LaFollette, Campbell Co., TN. Died: 15 Sep 1964      at: Bolton Cemetary, Campbell Co.
Born: 5 Jun 1906       at: Bennett, Tn. Born: 3 Jul 1909       at: Cupp, Tn. Died: 18 Jul 1911      at: Bolton Cemetary, Campbell Co.
Born: 7 Mar 1914       at: Cupp, Tn.